Whether you’re a beginner or have been using a bow for years, and whether you enjoy using a bow for hunting or partaking in archery sports, there is a suitable bow out there for you. If you know what to look for, there’s a good chance that finding what you need won’t be a challenge, but if you’re new to the game, you might need some help. Hence, we’ve looked into the SAS Spirit 66" Takedown Recurve Bow to show you why this could be the bow you’re looking for, regardless of your skill level. Is this particular bow right for you? Make sure to read this detailed review to find out. Southland Archery Supply (SAS) is the well-known brand behind the SAS Spirit 66’’ Takedown Recurve Bow. The bow is designed to propel arrows with precision towards the target that you are aiming to shoot at. Since its release, the model has remained relatively the same, and the SAS company has maintained their good reputation of consistently producing products that are capable of standing the test of time. The Spirit bow was designed in a way to make archery easy. Constructed with fiberglass and maple laminations, the bow is extremely flexible, but durable, ensuring that it won’t break. The riser portion of the bow is made from three types of wood that include chuglam, Gmelina arborea, and beech; hence, the pale cream color. These specialty woods come from trees in Asia and are known for their durability. This product is available in right and left-hand orientation versions and can be used by individuals as tall as six feet. SAS also kept the contents of their packaging relatively simple. You can find the standard user’s manual that tells you everything that you need to know and provides you with company contact information in case you need to reach out to them. The only downfall of the literature is it doesn’t appear to have any instructions to assemble the bow. That does prove to be quite challenging for individuals who haven’t assembled a takedown recurve bow before. Nonetheless, assembling one is rather straightforward, and regardless of the recurve bow in question, they all typically have the same design and can be put together in the same fashion. To make it easier for you, we’ve included a brief YouTube tutorial that breaks down assembling a recurve bow, so you have a better idea of what to do if it’s your first time putting one together. Once you are able to put the bow together, you should be able to take the pieces apart just as easily. Outside of that, the box includes everything that is needed to put the 66’’ Spirit Bow together properly. It’s important to remember that your purchase won’t include arrows and that they are something that needs to be purchased separately. It’s also recommended that you look into purchasing a bow rest, as the SAS Spirit 66’’ doesn’t come with one. If you are interested in the SAS brand but are looking for a takedown recurve bow that’s sturdier and has a nearly indestructible design, the SAS Explorer Metal Riser Takedown Recurve Bow might be your best bet. It comes at a mid-range price point and is made of high strength, casting aluminum riser. It has a fiberglass limb made of maple, and draw weights that range up to 34 pounds. This can also be used conveniently by individuals as tall as six feet. Although it only has a right-hand orientation, consumer feedback is outstanding. It would be a solid investment for those of you who are looking for something that won’t need to get replaced after a few uses or even those who are looking for a beautiful bow to put on display. Likewise, the high-finish polishing of the metal makes it a great piece to look at, or to use during live-action, role-play battle events. Although there are many other recurve bows, you can only purchase them in a right-handed orientation. SAS designed their Spirit 66’’ Bow for right-handed or left-handed archers. Similarly, the full range of draw weight makes it the perfect option for both beginners over the age of 12, as well as those who have experience. The company has made the claim that the Spirit Bow can be used for hunting adventures, as well as archery sports, tournaments, and live-action, role-play events. The SAS brand has a long line of reputable recurve bows that all have substantial customer feedback, and they continued their trend with the SAS Spirit 66’’ Takedown Recurve Bow. If the price point and customer reviews weren’t enough to convince you, this review should be more than enough to tip the charts in the Spirit Bow’s favor. The bow is a great purchase regardless of your skill level as it could provide you with everything you need to enjoy hunting adventures or archery sports. The only things that we found we didn’t like with this bow were the lack of assembly documentation, which is easily rectified with the number of tutorials that can be found online, as well as the length of the bowstring. We found that the string was a bit on the long side and it did take quite some time before everything came together the way it should be. 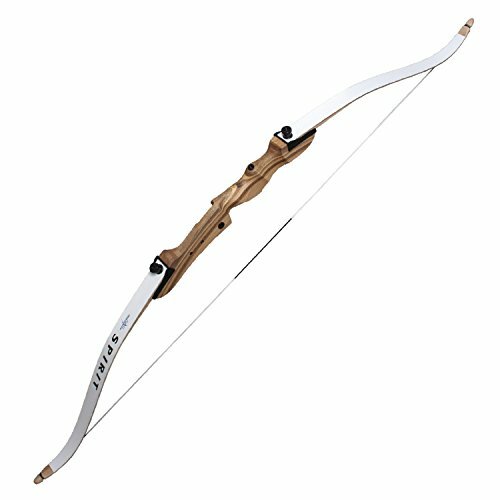 Other than that, we would recommend the Spirit 66’’ for anyone looking to purchase a durable recurve bow to add to their collection, or for anyone looking for a reliable bow to develop their skills. If you don't like the Spirit, why not check out our detailed list of the best SAS recurve bows here!